Hahn's Macaw Personality, Food & Care – Pet Birds by Lafeber Co.
A Hahn’s macaw’s personality is much like that of its larger macaw cousins — bold, fun, active — but in a more manageable size, which makes this parrot a popular companion. The Hahn’s macaw is one of the more popular mini-macaw species. Mini macaws have the same physical attributes as their larger macaw cousins, but in scaled-down proportions.They are a favorite of macaw fanciers due to their compact size, intelligence and superb pet quality. Though Hahn’s macaws are not as flashy as larger macaws, they, along with their close cousin, the noble macaw (Ara nobilis cumanensis), is highly prized for their “large macaw” personality in a mini-macaw body. Hahn’s macaws are native to Venezuela, the Guianas, Bolivia, Brazil and Peru, where it inhabits tropical lowlands, savanna and swamplands. As with any other bird, the Hahn’s macaw needs a well-balanced, nutritious diet to survive, the lack of which will greatly reduce its life span. Macaws need a nutritious, interesting diet. 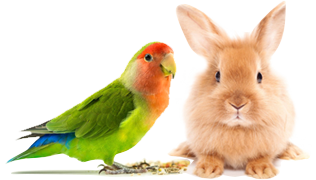 Check out Lafeber’s Nutri-Berries, Avi-Cakes, and Premium Daily Diet. These birds need space and exercise, and will become overweight if confined for too many hours a day. Remember, too, that macaws are extremely intelligent birds and need a lot of stimulation to maintain a healthy attitude. A depressed or unhappy macaw can develop neurosis and self-mutilating disorders. These birds are reported to live for more than 40 to 50 years if cared-for properly. Like larger macaws, the Hahn’s mini macaw is very intelligent and quick to learn vocalizations and tricks, including opening the cage door. When hand-raised, a Hahn’s macaw can make a wonderful pet. Owners will be charmed by their antics. Hahn’s are active birds, always on the lookout for something fun to chew or climb on, so watch out for your furniture and drapes. Hahn’s mini macaws are far more appropriate for children than a larger macaw is. They are easier to handle because of their smaller size, and their sweet temperament makes them less prone to nipping. However, take caution where birds and children are concerned — there is always the potential for injury on both sides. Hahn’s macaws are between 12 and 14 inches long, making them more suitable for apartment living than a large macaw — but only if your neighbors are deaf. These are noisy birds, especially if you have more than one. Their voices are grating — Hahn’s are not the most pleasant-sounding birds in the parrot family. Hahn’s macaws can be wonderful talkers, however, and will learn many words and phrases. Hahn’s macaws are good whistlers, too, but may take to whistling over talking, so teach them to talk before you give whistling lessons. Like other macaws, Hahn’s macaws are prone to self-mutilation/feather plucking, and nutritional disorders, and a variety of diseases, including Macaw Wasting Syndrome, as well as overgrown beaks. A nutritionally balanced diet and regular veterinary health exams can help keep your scarlet macaw healthy and thriving. The Hahn’s macaw is easier to find than some of the other macaw species. It is a favorite of bird breeders because the space it takes to breed these birds is far less than with the much larger macaws. You likely won’t find a Hahn’s mini macaw in large pet stores, but from avian-specialty stores and from bird breeders. The smallest of the miniature macaws, the Hahn’s macaw is primarily green with a fleshy white face-patch. Hahn’s macaws are smaller than some of the larger conure species, and can easily be mistaken for a conure by a novice.